Blast Poker from 888 - The New Lottery SNG Format with 10,000x Buy-In Prizes! Genuinely new ideas in poker are rare these days, though the adaption of the popular ‘Lottery Sit N Go’ format that 888 Poker has come up with contains some fresh new ideas. This new format is called ‘Blast Poker’, and is a super-fast 4 handed game with a randomly selected prize pool which can be up to 10,000 times your buy-in. For example, you could join a $5 game, and find yourself competing for a share of $50,000. You’ll find out about this new game on this page. First of all an outline of how things work and the different buy-in and prize options is directly below. Next, some great reasons to check out this new format (3 reasons to play). Finally, for those who might have missed out, some of the many other attractions at 888 poker are covered. New players at 888 Poker can claim up to $88 in real money play (tournament tokens + cash game buy-ins). No credit card info or deposit is needed. 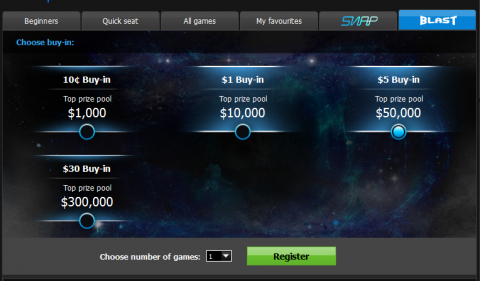 This is a great way to check out the new Blast Poker games. If you win a couple, you might never need to make a deposit at all! See www.888poker.com for the terms and latest promos. Each Blast Poker game only lasts for 6 minutes. The blinds start of at 25 / 50 chips, and then go up every 2 minutes until 100 / 200 (you’ll have 1500 chips to start). Once the timer hits zero, the table gets surrounded by electricity / lightning effects and everyone is all in for every hand from that moment on. From my experience around half of the games get to the all-in phase with 2+ players, while the other half are over before that. Each game is 4 handed, and the prizes are distributed to 1, 2 or 3 players depending on how much money is around. For example, if you join a $5 game with a $50 (10x) prize awarded, then the prizes are distributed $30 to 1st, $12.50c to 2nd and $7.50c to 3rd. If the game has only a 2x buy-in then everything goes to the winner. Most games have 2x prizes awarded, as this is what pays for the occasional bigger ones! You only find out the prize pool and see your opponents after you join. 3 Great Reasons to Play Blast Poker Now! 888 Poker is well known as the home of recreational / amateur poker players – rather than the ‘grinders’ who take the game more seriously found at sites like PokerStars. The games at 888 are soft enough, though what do you think might happen when the average player sees a new game advertised in the top menu? #1 – Fish Heaven! Yep, for a while at least, the Blast Poker games will be filled with recreational players and fish just having fun. If you know even a little poker strategy, and can adjust to the fast format, then you should be able to make a killing in these games. The sooner you can jump in the better! #3 – 888 Poker Give You $88 Free: My final reason is that you get to try these games for free anyway, with the $88 offer for brand new accounts. This comes in $8 increments (11 of them) and does not require a deposit or any card info. You can still claim your 100% matched welcome bonus at any point down the line if you like what you find. See www.888poker.com for more info. 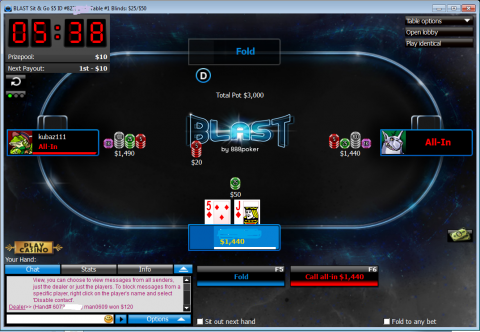 I have covered some strategy considerations for Blast Poker over at my Sit N Go site - SNG Planet. I have already said that this site is the home to many more recreational players than pros, and this really is the main reason that I have shifted the majority of my play to 888. There is a whole host of extra reasons to check out the games. These include SNAP Poker (the fast-fold variation at 888), which is incredibly soft up to the mid-range buy-in levels. The tournament schedule is also worth a look, there are daily guarantees which are named after different fish. These range from the small buy-in Goldfish tournaments through to the big spender events of ‘The Whale’. 888’s poker bonuses and promotions are the best out there, period. What is even better is that you’ll go up and up in the loyalty reward scheme as you play more games – and never come back down again. You can use points to buy even more bonuses or cash rewards. Smart software, super-soft games, $88 free and now the chance to win 10000x your buy-in with Blast… what better reason do you need to check out www.888poker.com for yourself now! More on the excellent 888!